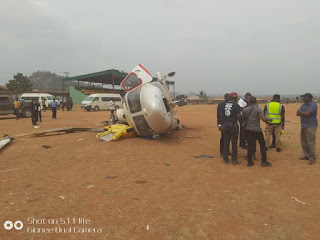 Home / Unlabelled / Osinbajo: The Cause Of The Helicopter's Crash Finally Emerged... MUST READ! Osinbajo: The Cause Of The Helicopter's Crash Finally Emerged... MUST READ! It said it has informed relevant authorities connected with the probe of the incident. In a statement, Caverton Helicopters said there were no injuries to either Osinbajo or any of the passengers. The statement said: “An Augusta AW139 Helicopter, under management by Caverton Helicopters was involved in a mishap on landing in Kabba, Kogi State around 3pm today (2nd February 2019) as a result of unusual weather conditions. “There were no injuries to the passengers or crew on-board and they were all quickly and safely evacuated.